This design has been issued in 2007/2008 and remains one of Hermes' most impactful abstract designs. It depicts the Maison's iconic building at 24, Faubourg as perceived through a kaleidoscope. The kaleidoscope, invented around 1816 by the Scottish physicist, mathematician, astronomer, inventor and writer Sir David Brewster, is a tube of mirrors containing loose coloured beads, pebbles or shards, which produces, when turned, varying colours and patterns; because of the mirrors, the reflection of such arbitrary designs produces beautiful symmetrical patterns, something that I used to cherish as my secret treasure whenever my grandparents would buy me one, typically when we were vacationing on the Black Sea (the name kaleidoscope derives from the Greek "kalos" (beautiful), "eidos" (shape) and "scopeo" (to look at, to examine) - hence it would be roughly translated as "looking at beautiful forms"). Faubourg by night depicts the iconic building as an elusive shape, covered under the night's dark skies, yet the image reminds us of the intrinsic beauty of this place. It even stirs our imagination and our curiosity to discover it. 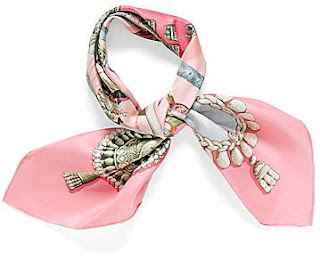 A truly gorgeous design the ties beautifully and is guaranteed to elicit the admiration of any audience. An earlier design that's as simple as it is stirring. The bullfighting, one of Hubert de Watrigant's favourite themes, brings dynamism and a certain adrenaline rush to the scarf (and particularly to both admirers and those who sport it). The raw and primal fighting for survival, coupled with the stage "dance" and bullfighters' harmonious movements make the "Plaza de Toros" a sensual enough scarf to be sported by ladies and masculine enough for men. Of all the scarves illustrated here (including those in my collection), I would definitely consider wearing this one ! This post continues the tradition of depicting scarves that pay tribute to distinguished craftsmanship, artistic sensibilities and vision. 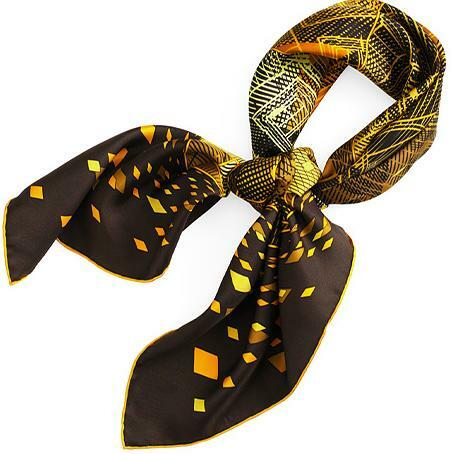 More, the colour combination of this particular scarf is also a discreet yet impactful homage to the House of Hermes (with its distinct and emblematic orange as the predominant colour of this scarf). Emile-Maurice Hermes (18 December 1871 - 11 September 1951), the grandson of a founder of saddle and harness manufacture in the Grands Boulevards district in 1937, is said to have acquired an unusual switch attached to an umbrella from an antique dealer at the tender age of 12. This is how the legend of the collector "par excellence" was born. Throughout his rich life, Emile built an impressive archive of items which he categorized into various collections, including a true "Museum" of equine transport, from which this design drew its inspiration. 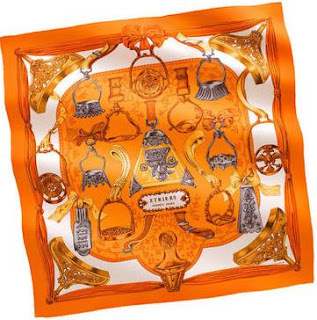 First launched in 1964, this scarf has been met with enthusiasm by Hermes' loyal customers and admirers alike, and has been reissued in 1990, 1997, 1999 and again in 2009 (the picture is part of the latest reissue). The scarf depicts various stirrups that, as with many other creations, have evolved over time from strictly utilitarian objects to articles of art and tremendous craftsmanship, intended to garnish the feet of male and female gentry riders, around the world. A side-step saddle stirrup from South America (19th century) is depicted alongside a silver-finished wooden stirrups from Peru (18th century), a pair made of brass from the Middle East and a copper pair from France and Spain (end of the 18th century). Their variety, inventive beauty of detail and ingenuity are a testament to the craftsmen who continue to place their know-how and talents to the service of the noble equestrian art. May we all find inspiration in the experiences we create and people and things we come across, find the courage to turn that inspiration into wonderful outcomes, and continue to inspire those around us. Another variation on the theme of "In the Pocket" is this truly phenomenal scarf, depicting an outstanding taupe background. The little objects that are forgotten in corners of our pockets - coins, paper clips, buttons, the corner of a newspaper, an elastic - are active story tellers, their murmur bringing our experiences past back to life. A remarkably distinguished and exceptionally elegant colour that renders this design one as of the most exquisite scarves ever produced. The designer, the very talented Leigh P. Cooke.